You have decided to sell your home, and you are eager to sell it ASAP! Here are some of the best ways to efficiently and effectively improve your home for a speedy sale. Put a fresh coat of paint on your home’s front door. Yes, it seems expensive or time-consuming. However, if you hire a handy person, this can truly make the difference and get you more money in less time. They say setting the mood is like flipping a switch and we couldn’t agree more. Lighting plays a lead role in making your house feel like home. Here are 10 lighting tricks to enhance your home’s aura. 1. Control natural lighting. If you thought only stormy weather could make a breezy beach house look dark and moody, take a second look at the photo above. The lucky homeowner can draw the sheer curtains closed without completely blocking out the sun. They also get a postcard-worthy view of sunrise and sunset every day from their glass doors. 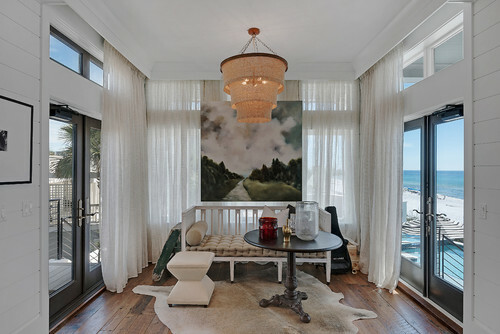 The dimmed fixture above casts a warm light in an all-white room while the cloudy landscape photo tones down the views of the beach. 2. Be picky about your paint. Ask a professional about a paint’s light reflectance value (LRV) before you commit to a color. Lighter colors tend to be more reflective than dark shades. Pay attention to sheen level too since glossy finishes are more reflective than matte finishes. 3. Experiment with materials and finishes. When mixed and matched strategically, these seemingly small details can determine the mood of a whole room. 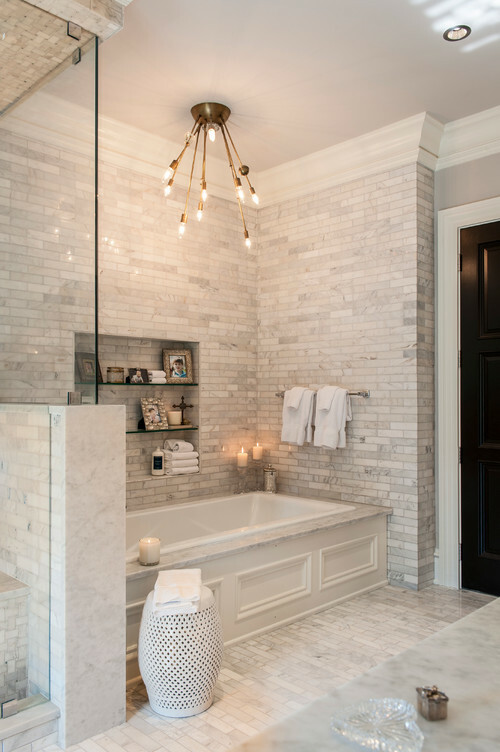 This white and grey bathroom would look stark and cold without the brass fixture above. The candles around the tub help warm the room up too. 4. Install a dimmer switch. There’s nothing relaxing about straining your eyes in a room that is too bright or too dark. Use a dimmer in addition to layering your light sources for ultimate light control. Believe it or not, installing a dimmer switch can be a DIY project. 5. Recess your lights. Even if the bulb is not that bright, a central fixture with multiple bulbs and a shiny finish can be overpowering. Recessed lighting conceals the bulbs and therefore can lights feel softer. 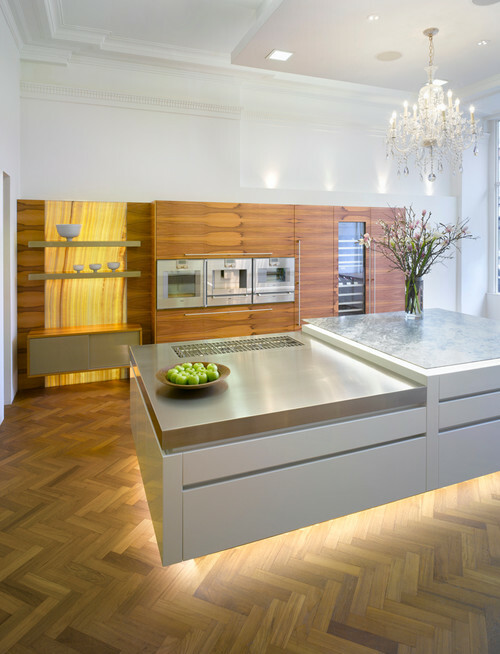 You could also hide strip lighting underneath cabinets for a nice nightlight on your way to the kitchen or bathroom. Check out this ultra contemporary island that appears to be floating mid-air. 6. Go a different direction. Uplights, like sconces and track lighting, create a soft glow. On the other hand, downlights cast ominous shadows that can really add mystery to a romantic room. 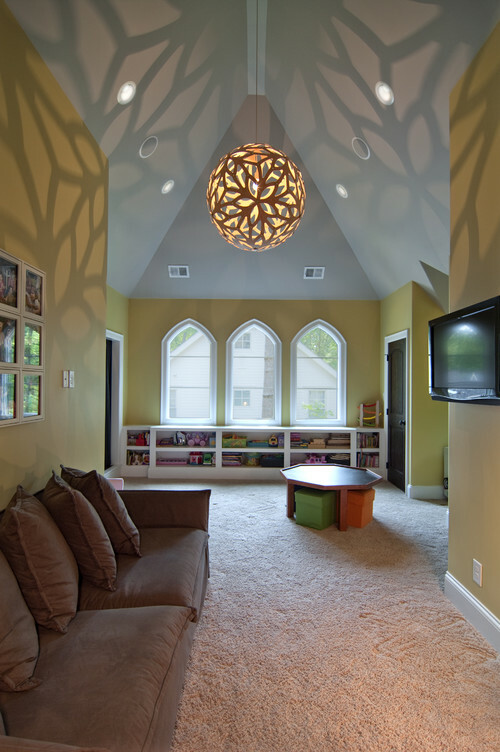 Get creative by backlighting wall decor for a play on color and shapes. 7. Take a refresher course in lightbulb basics. The type of bulb is equally important as its fixture. Halogen, fluorescent and LED bulbs have a range of temperatures from warm (or yellow) to cool (or blue) hues. This is a matter of personal preference, but typically yellowish bulbs warm up cool-colored rooms nicely and vice versa. Bluer bulbs also help brighten darker spaces, like basements and windowless bathrooms. 8. Find your favorite shade. Bright colors, playful patterns and funky shapes can bring personality into a stale space. Smoky glass chandeliers intensify intimate vibes in a dining room while big paper lanterns enliven sophisticated home offices. The teal shades on this fixture match the pillows and put an icy sheen on the large dark walnut bookcase. Note: This ceiling light is reflected in the whimsically shaped mirror that will help spread light further into the room. 9. Try twinkle lights. Not limited to holiday decor, you can use twinkle lights all year round. Drape them over windows for some extra sparkle or fill jars or empty wine bottles with a bundle of battery-operated fairy lights for an illuminated vignette. 10. Open flame. It’s no secret that candles are customary to ambience, but they’re often reserved for after dark. Next time, try starting a fire first thing in the morning and you’ll find that candles are as effective for waking up as they are for winding down. The heat will naturally draw you out of bed and the rising sun will energize you. 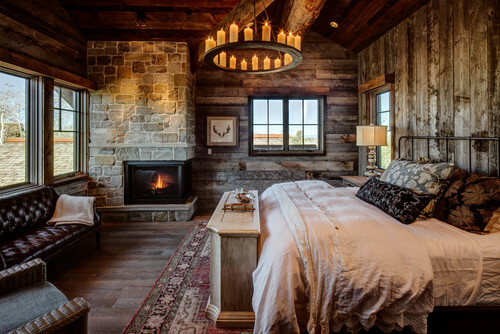 We’re channeling all the feels from this rustic bedroom. The corner fireplace and candle chandelier are nothing short of mesmerizing. Consult with the Mash Team and we can recommend a professional stager who will have an objective eye and knowledge of what appeals to today’s sophisticated buyers. They will provide a range of solutions for enhancing your home showings by recommending everything from furniture placement to wall color to complementary modern accessories to add clean, welcoming style. A positive or negative first impression makes all the difference when you’re showing your home, so make note of these tips to help you create the best initial reaction possible for potential homebuyers. Show your home in its best light. Dark rooms strike the eye as being smaller than they really are, so maximize neutral light in your home by throwing open all your window coverings during the day. Also, make sure all your light fixtures are turned on, and consider (temporarily) switching out low-watt bulbs for some with higher wattage, to brighten rooms even more. Tone it down. Bold colours are difficult for buyers to see past and busy pattterns are visually distracting, so tone down and neutralize: repaint those loud walls, tear up that busy carpet and tear down that dizzying wallpaper. Kick clutter to the curb. 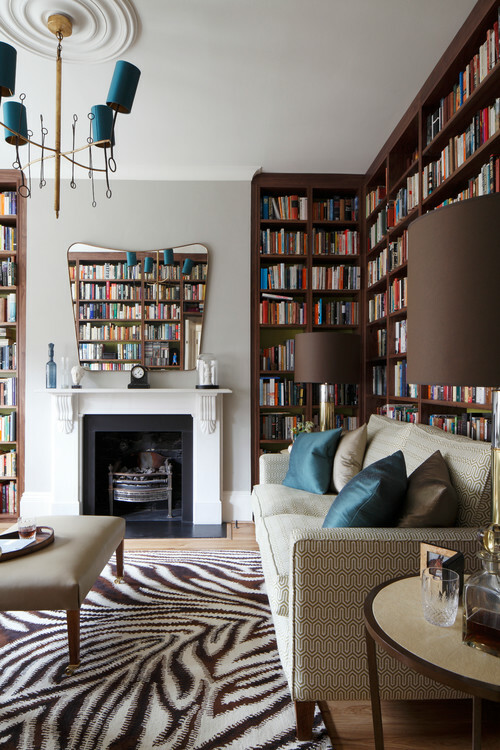 Like darkness, clutter tricks the eye into thinking spaces are smaller than they are, and like loud colours and busy patterns, it’s distracting and hard to see past — not to mention it can cause buyers to wonder what else is being neglected in the home. Create the illusion of more space. Open up your closets and have a look. Now remove half their contents. Do the closets look bigger to you? They will to buyers, as well. Another easy trick to visually open up spaces is to strategically place mirrors in small areas like foyers, hallways and anywhere they’ll reflect natural light.